Wintertime meals are undoubtedly some of the most soul satisfying and comforting foods out there, and this dish doesn't miss a beat. 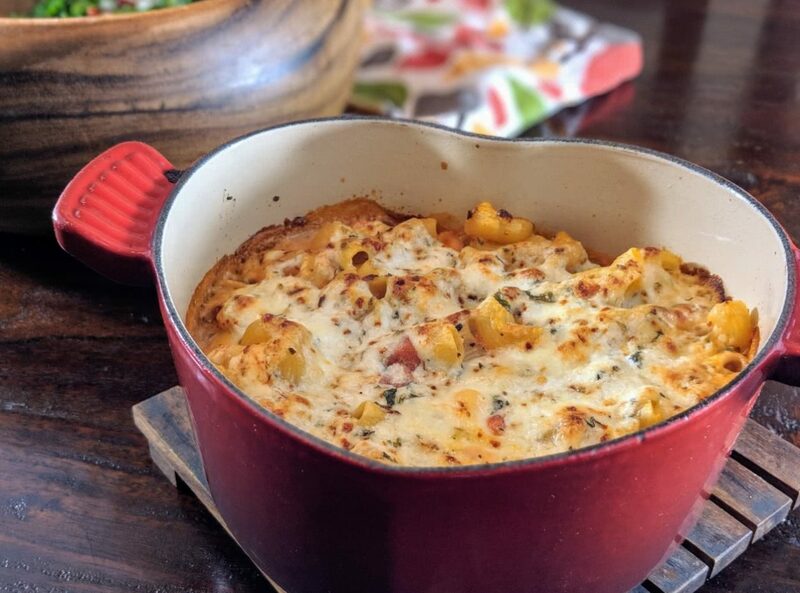 The blend of five distinct cheeses brings the pasta bake together, making each bite unique and anything but boring. With the addition of more seasoning and spices than what the original recipe, this dish has become a regular rotation for the weeknight dinner. When mixing the cheeses, add in the additional dried spices and liberally salt and pepper. Bake the dish on the middle shelf at 500 degrees Farenheit for 16 minutes and then put it under the broiler for 2-3 on the second to highest shelf. Make sure to liberally use olive oil on the dish before placing the pasta mixture into it to ensure that the pasta does not stick. Use more than seems necessary. Make half of the recipe and the changes for three servings (or two large servings with some leftovers), as the pasta bake day of is much better than the leftovers. Reheat the dish in the microwave with a large splash of milk.